Here's a little secret that'll smooth all your worries when it comes to your little one's wayward wavy, curly hair. It's time to show those nagging curls their right place, it's time for SheaMoisture's Coconut & Hibiscus Kids Extra Moisturizing Detangler. This hair care product is nothing short of a magic potion that will bring bounce and life back in your child's hair. 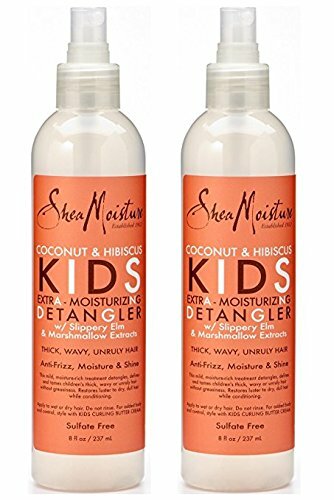 SheaMoisture's detangler spray for kids is an absolute must have hair moisturizer, this nourishing detangler contains certified organic Shea Butter, which is essential in keeping hair frizz-free and soft as silk. Slippery Elm Extract makes hair smooth to touch while Coconut Oil hydrates, and helps in defining curls. It also contains Hibiscus Flower Extracts to add lustre and volume to hair, giving those kiddie curls extra bounce! SheaMoisture's Coconut & Hibiscus Kids Extra Moisturizing Detangler protects and moisturizes hair from roots to ends. Its natural ingredients make it completely safe for use by children of all age groups. Apply sparingly on wet or dry hair and watch as this product weaves its magic to transform your child's wavy, curly hair to beautiful, frizz-free, glossy curls. Apply to wet or dry hair. Do not rinse. For added body and control, style with Kid's Curling Butter Cream .